Gemini Systems has witnessed a big shift towards adoption of technology in recent years, with dealers aiming to reduce administration overheads and digitise processes. This shift has largely been driven by tighter margins and a more challenging market, which has made cost-cutting essential for many. The uptake of Gemini Systems’ app-based features, such as eVHC, video, digital service advisor, and technician clocking, was unprecedented in 2017 and 2018, as digitising these processes undoubtedly adds profit opportunities and reduces staffing costs. Another major dealership overhead is the double- or triple-keying of data into different systems, whether to satisfy manufacturers or to take advantage of best-in-class solutions to improve their business. The DMS is at the core of every dealership, but it can never be all things to all people. Gemini Systems strives to be at the forefront of OEM integration, however manufacturers occasionally mandate third-party solutions, such as showroom systems. Gemini Systems had the foresight to differentiate itself from other DSPs and, four years ago, developed Open System Interface (OSI), an innovative API allowing third-party solution providers two-way data integration with the DMS. 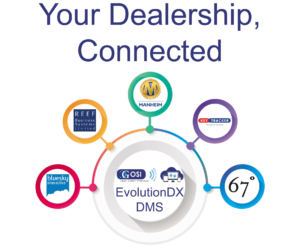 Since then, some of the biggest names in the automotive industry have partnered and integrated with Gemini Systems, giving their mutual dealers significant competitive advantages with data shared live across all (previously separate) systems, leading to a reduction in administration overheads, and improved accuracy. The possibilities of integration via OSI are virtually limitless and several more key providers will finalise their integrations over the next six months.